Our professionally refurbished Motorola MC75 units are a customer favorite. 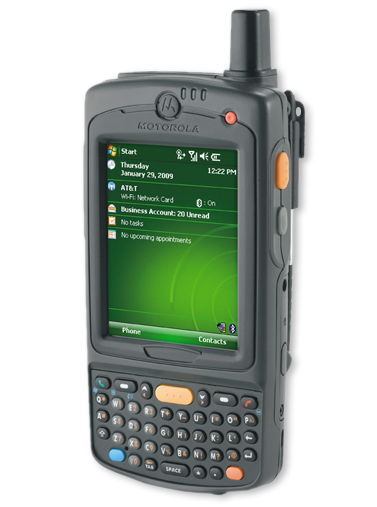 The Motorola MC75 series isone of the world’s premier EDAs, offering more enterprise features and functionality than any device in its class. Turbocharged with many Zebra MAX features, the Motorola MC75A addresses business mobility needs. Contact us today about buying, servicing, renting or selling Motorola MC75 gear! Turbocharged with many Motorola Mobility Architecture eXtension (MAX) features, the Motorola MC75A addresses top business mobility needs, offering maximum processing power, rugged design, flexibility in extending solution reach, data capture capabilities, connectivity options, security and manageability. Contact us today about buying, servicing, renting or selling Motorola MC75 gear!